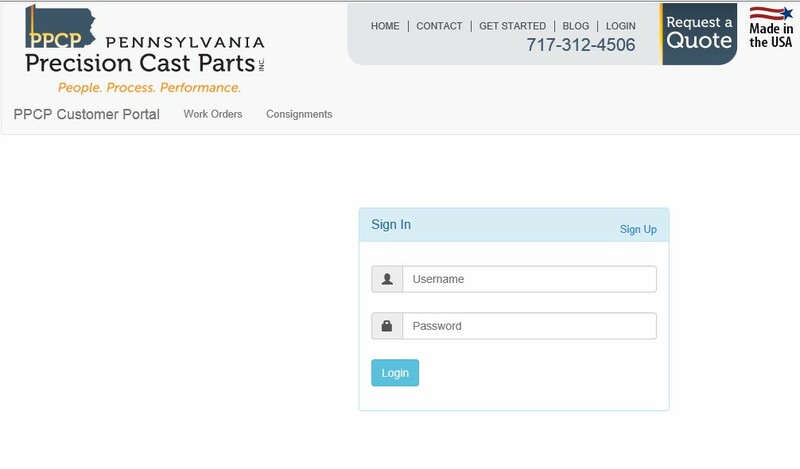 Pennsylvania Precision Cast Parts (PPCP) is now providing its customers with a customer portal to monitor the status of all of their investment casting jobs. The customer portal can be accessed through the PPCP website. We designed our new customer portal to provide quick, easy, immediate access to job status right on line. Pennsylvania Precision Cast Parts (PPCP), an industry-leading investment casting company located in Lebanon, Pa., has launched a new customer portal on its website, http://ppcpinc.com. The portal provides an immediate way for customers to monitor the status of all of their PPCP investment casting jobs, from start to finish. To utilize PPCP’s customer portal users can sign up to get a user name and password by clicking LOGIN at the top right side of the PPCP website. After making sure that the person making the request is authorized, the user with can have complete access to their company’s job status. The customer portal provides the following information about each job: purchase order number, part number, order quantity, due date, PPCP number, work order number, quantity shipped and ship date. For each job, the percentage of completion is indicated for the following process phases: injection, assembly, dipping, pouring, cutoff, finishing and final inspection. In addition, jobs can be sorted and displayed by any of the following criteria: customer, work order number, P.O. number, due date, ship date and due date range. Customers who take advantage of PPCP’s Zero Days Lead Time Stocking Program (consignment program) can view current inventory, in process, work order, target quantity and remake level. Jobs are also sortable by multiple criteria. The PPCP customer portal can be accessed using virtually all current platforms on computers, tablets and smartphones.